Ask any vegan or vegetarian – the more plants you eat, the healthier you are. And when you bring the activity of juicing into the mix, you will see an even greater boost in overall health and wellness. If you aren’t juicing yet, then it’s time to start right now. One great aspect of juicing is the ability to consume more than you normally would in an easy way. Let’s say you want some of the rich benefits of kale. You could serve some with your dinner tonight, getting about a half-cup of the greens, or you could add it to your blender and get far more without feeling full. In addition, you could add some carrots, cucumbers and parsley and all of the benefits they offer. As a morning meal replacement or a snack mid-day, a smoothie or juice can help you get your body in top condition. You have two options when deciding to juice: using a juicer or a blender. I personally prefer a blender, as the “juices” become more smoothie-esque. When you use a juicer, you are missing out on much of the fiber found in the whole vegetables. In a smoothie, you get it all. Some people don’t like chunks or the thicker texture of a veggie smoothie, while some people love it. The bottom line is that both juices and smoothies are excellent for you and either will work. Next, deciding what will go inside. Some say it’s best to separate your vegetables from your fruit. But, particularly to those new to juicing, an all-green veggie juice can be a little hard to take. Fruit supplies a little bit of natural sugar to make the juice more palatable. 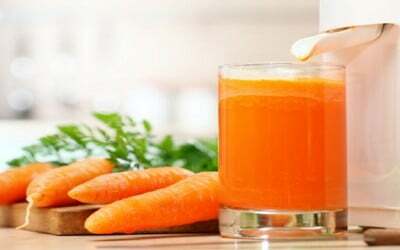 Read more about how beneficial juicing can be. When juicing, it’s good to very often choose a leafy green vegetable; this should be the foundation of your juice or smoothie. I like kale but again, it’s a really dark veggie and some prefer something a little smoother. Spinach is a great option too. Then, add what you like. Cucumbers offer great detoxifying benefits and plenty of water with little taste—they are a common addition to vegetable juices. Celery is another frequent fave. Herbs like cilantro and parsley are great additions that provide a clean, crisp flavor. Get creative and have fun. Keep it organic when possible and add water, coconut water, or almond milk rather than prepared juices for any necessary liquid. Once you start juicing, you’ll find some favorite combinations in a short time and be reaping the many health benefits for the rest of your life. Great choice! Juicing has also made me a lot healthier, using celery, cucumber, green apple, carrots, ginger, lemon, and leafy greens. It’s delicious and nutritious! I know how good it feels, though!!!…. it is inpayable unpayable not payable — whatever! Organic vegetables and fruits are so expensive, that to juice them can only be payed by those you mentioned…. I am a diabetic and follow the regime of Dr. Richard Bernstein, and juicing would be the most unhealthy thing I could do, because of the high carbohydrate load. If you are going to push the juicing, you might put a note in that it is not good for diabetics. * You are absolutely, positively wrong about your subjective & erroneous perception about juicing…carbohydrates are the worst thing to eat for diabetics…I am a VERY HEALTHY & TOTALLY UNDER CONTROL type 2 diabetic!! !…so before you pontificate with bogus propaganda …educate yourself & juice VEGETABLES & eat fruit sparingly…stop eating ALL breads & grains to get off the the GLIADIN glucose roller-coaster ride…stop spreading erroneous info…again… EDUCATE YOURSELF!…your doc is ignorant. *… I've been juicing vegs for 2.5 yrs now -everyday!…not so as to live longer, but to improve my 'grok' perspicacity, with clarity of perception…it worked!…my memory is as acute now, as as when I was a young man…eliminated ALL joint pain…oblivious to the flu…feel eternal (lol)….I also eliminated 30 lbs that has 'stayed off' (for over a yr), without any overt exercise, just by eliminating ALL breads & grains (google-wheatbelly.com). I have been juicing for over a year now. What a change! Overall, my health got much stronger. My nails that were always so brittle, are now thick and strong. I try to make juice every morning before work. I have to get up 20 min earlier, but it is worth it. My regular mix – celery, cucumber, apple, pear, carrots, ginger, lemon and beets.